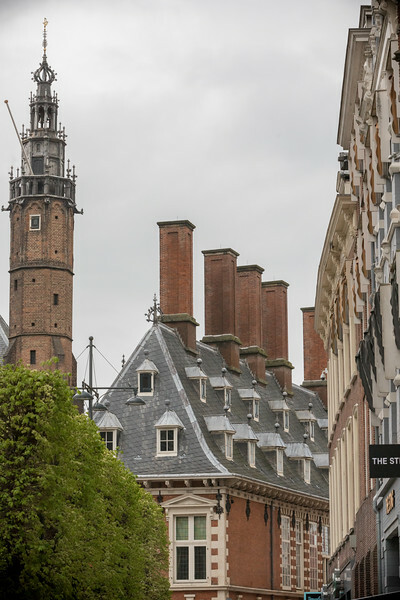 The center of Haarlem is a market square in the heart of the old town. It is surrounded by several canals, merchant shops, and gabled houses. Two of the most notable buildings on the square include the Great Church and the town hall - built in the 13th century, with 17th-century additions. Most trade and shipping commerce moved to Amsterdam in the 17th and 18th centuries. At the end of World War II, much of the remaining industry moved out. Currently the the tulip bulb trade provides the largest source of revenue. Tulips are grown south of the city from Leiden to Haarlem, but many administrative offices are still within the city.